I'll come off my chocolate horse for a moment and deliver a recipe completely un-chocolatey. That's against the grain on Scientifically Sweet, but sometimes necessary. I love this cake. It has zero chocolate in it, but still... I love this cake! There's nothing more appropriate for a Summer dessert than lemon and berries. This cake is light on the palate and light literally. It is so fluffy and soft that it would easily go unnoticed if one ate the entire thing. 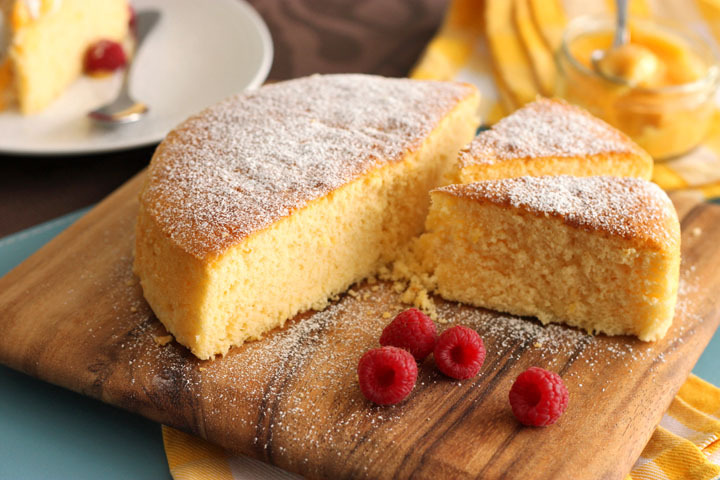 Like most fluffy cakes, this one is a sponge cake which is made from mainly eggs and with little or no fat. Today's recipe is a hybrid. 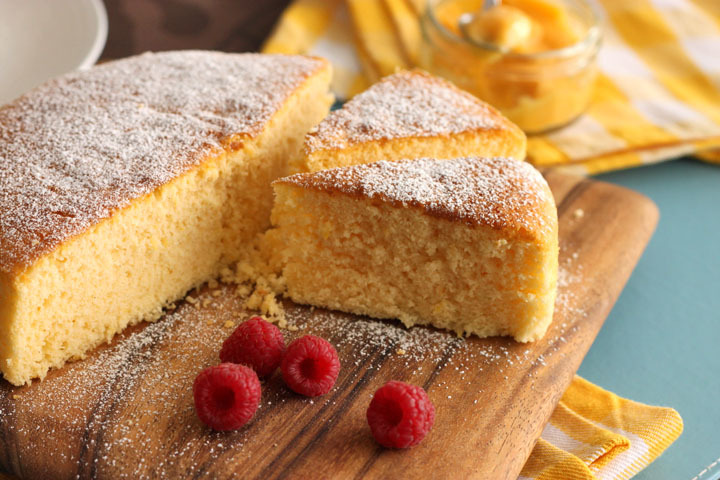 It is a sponge cake by definition of its method, but with way more flavour and mouthfeel than it typically deserves. Flavour and mouthfeel comes in two ways: butter (a mere three tablespoons) and egg yolks. Yolks not only create a golden yellow crumb to match the lemon theme, but they are the most wonderful flavour enhancers. 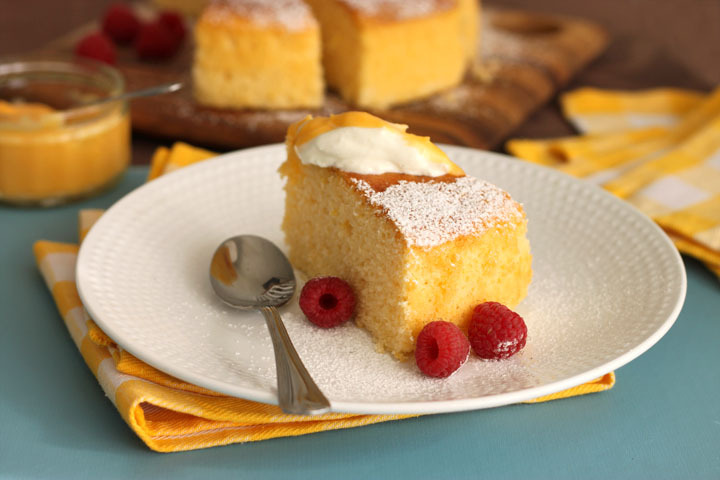 The interesting thing about this recipe that makes it a sort of rebel in the land of sponge cakes is the addition of warm liquid. Let me explain... Sponge cakes always involve creating a foam, whether it is whipped whole eggs or beating the yolks and whites separately. This protein foam is a delicate one and heat generally causes foams to collapse unless they are stabilized. Luckily our foam is stable thanks to sugar. So, introducing warm liquid isn't a huge issue. Why do we warm it in the first place? It's to melt the butter and infuse the lemon flavours from the zest right through it. Cake flour is also important here to protect against excessive gluten development which would otherwise lead to a more dense texture. All-purpose flour would be more sensitive to gluten development, especially in the presence of warm liquids. If you want to try this recipe with AP flour, make sure you follow the measurements by weight and consider replacing 1 tablespoon with corn starch. 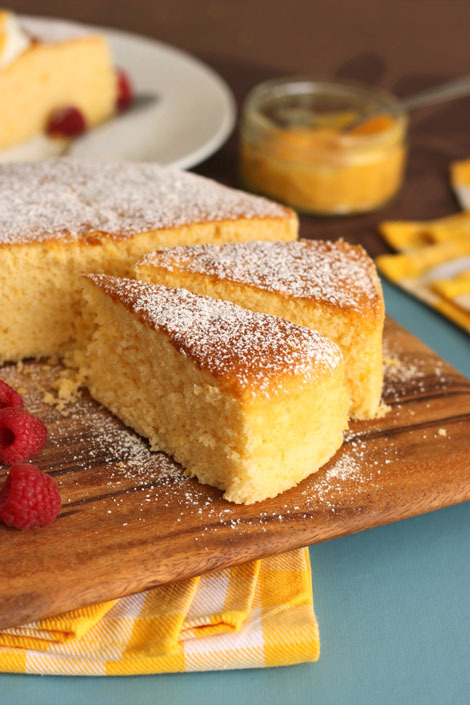 To make sure your super light and fluffy cake doesn't make a fool out of you by collapsing only 30 seconds after taking it from the oven, ensure that it is cooked through. There is often a lot of talk about over-baked and dry cakes, but that's not any worse than one that is doughy and soggy. It should be evenly golden brown, slightly domed and it will spring back when pressed lightly. A skewer inserted to the middle should be totally clean. Do not open the oven door until it is at least 3/4 of the way through the suggested baking time to prevent any disappointment. Now the curd! 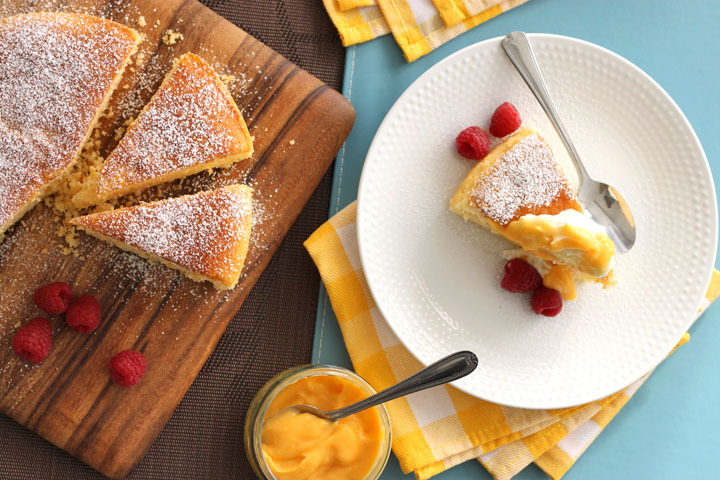 This lemon curd is so easy and crazy delicious that it will become your go-to. Egg, yolks, sugar and lemon juice get whisked up in a saucepan until smooth. Some bits of butter go in and then the whole lot goes over medium-low heat and stirred until smooth and thick. Normally I prepare lemon curd over a double boiler, but with this method you can go straight over the heat. As the pieces of butter melt they coat and protect the egg proteins from curdling. This results in a softer set - perfect for spooning over this cake... or ice cream, or toast or scones. Serve it with pasta. I don't care! Preheat oven to 350°F. 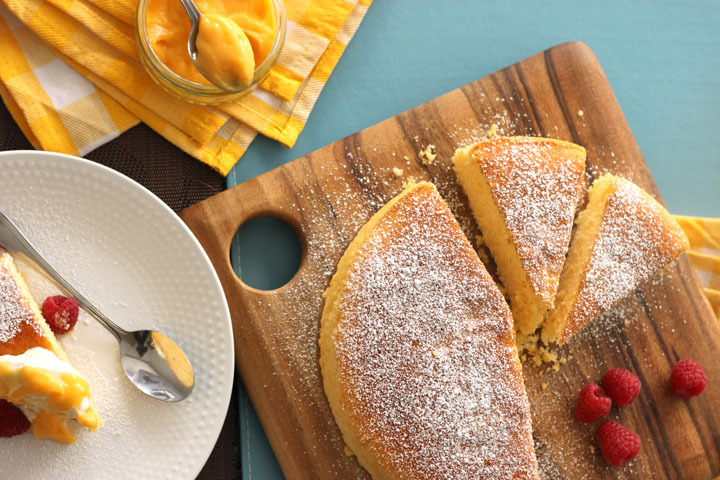 Line an 8-inch round cake pan with parchment paper and set aside. In a mixing bowl, sift together cake flour, baking powder and salt; whisk to blend well. Combine milk, butter and lemon zest in a small saucepan over medium heat and bring to a simmer. Remove from heat and let steep for 10 minutes, covered. In the bowl of a stand mixer fitted with the whisk attachment, combine eggs and sugar; beat until pale yellow and doubled in size, about 4 minutes. Beat in vanilla extract and lemon juice on medium-low speed. With the mixer on medium, slowly pour in the warm milk mixture, mixing just until incorporated. Turn off mixer, sift flour mixture over the lemon mixture and gently fold it in. 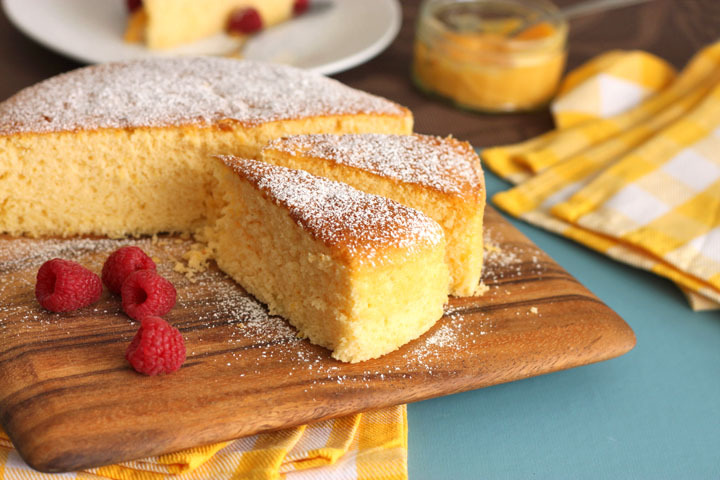 Pour batter in prepared pan and bake for 25-30 minutes, or until evenly golden and a toothpick inserted in the center of the cake comes out clean. Remove from oven and transfer to a cooling rack to cool completely. To make the lemon curd, whisk together whole egg, yolks, sugar and lemon juice in a small saucepan until evenly blended. Add butter and place over low heat. Cook while whisking constantly until mixture thickens to the consistency of pudding. Press mixture through a sieve and into a clean bowl. Refrigerate until set. 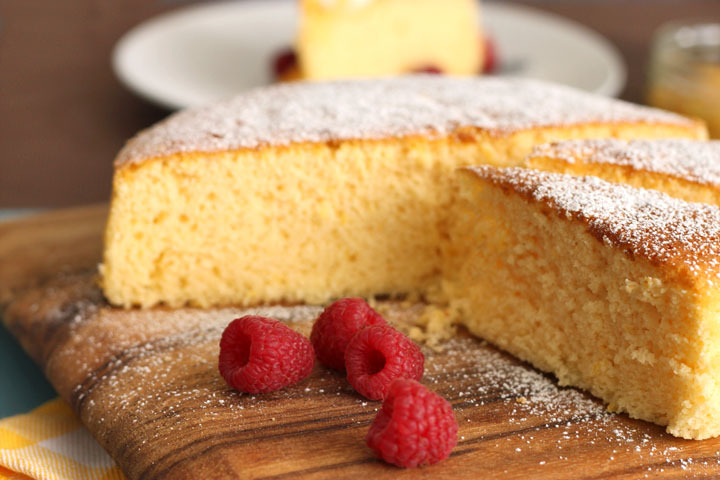 Serve slices of cake with a dusting of icing sugar, a dollop of curd and fresh berries. You know what this needs? Chocolate. Anyway, it looks lovely. A good excuse to use the Kitchen Aid.